Tina at Inkers (since renamed to the unfortunate 'Inkers Dream Wizard Tattooing'), a tiny shop on back roads in suburban Maryland, did the deed. I drew the design myself & brought it to her to use the summer I was 18, one day after my internship at the local City Hall. I paid cash & tipped well. A friend was supposed to come & sit with me while Tina worked, but she flaked, so I was there alone, which I ended up liking better anyway. I chose the dragonfly because when I was a kid, my mom used to tell me that if you’re talking & a dragonfly is nearby, it will sew up your lips. I kind of knew this wasn't true, but I also kind of knew it was true, somewhere or somehow else, even if only in our warm minds. I wanted to preserve & represent that feeling of simultaneous, balanced belief & disbelief. The tattoo is getting a little fuzzy now, as it approaches 14 years old, & I keep meaning to get it touched up, but I also like to see it change. My best friend got married in a Catholic ceremony when we were 26, & I asked her & her fiancé whether they’d like me to wear a sweater in the church (our bridesmaid dresses were strapless). They said it was thoughtful of me to ask, but that there was no need. Karen later said that guests kept coming up to her & saying what nice posture I had. 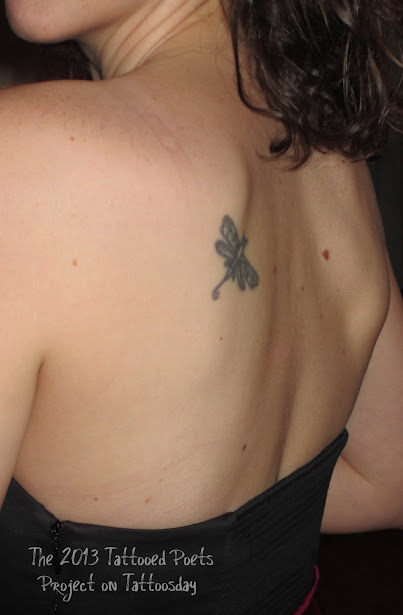 Part of the reason I got the tattoo was because I wasn't the type people would guess to have one. That I have one still surprises some people when it comes up, which I find amusing. Someone recently, at a rehearsal dinner for a different wedding, guessed correctly that I took French in high school, not Spanish, apparently from the way I comported myself. 'You can just tell,' she said." flora & fauna, each other’s bacterial. to forget—you told me that was indeed a way. Jennifer H. Fortin’s first book of poems is Mined Muzzle Velocity (Lowbrow Press, 2011). She lives in Upstate, New York. You can find her online at www.jenniferhfortin.com. 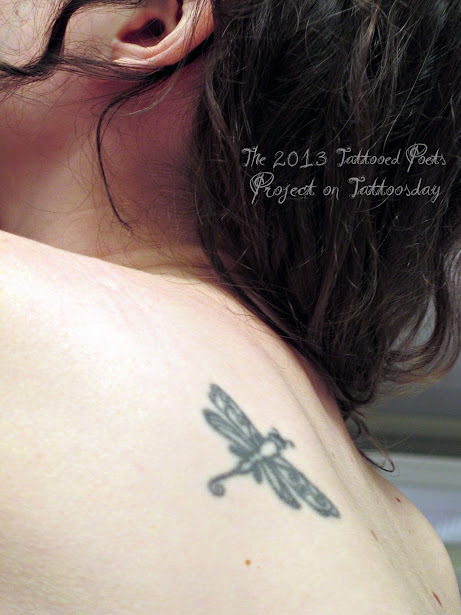 Thanks to Jennifer for sharing her tattoo and poem with us here on Tattoosday's Tattooed Poets Project!